In Orange County, we have more than 280 days of sunshine a year and homeowners are taking advantage of it. Being able to enjoy outdoor living spaces for the majority of the year is just one of the many perks of living in Southern California. There are many ways to create an outdoor space that feels like an extension of the home. These include outdoor kitchens, bars, and media entertainment areas. Creating a cohesive design between the indoors and outdoors includes not only great space planning but also material selection. 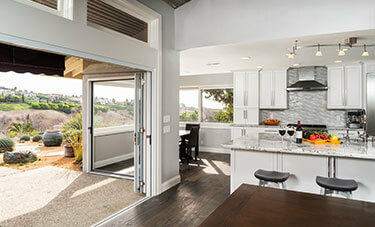 Many Orange County home remodels are now including bi-fold doors in their outdoor spaces. This allows for a seamless transition between the interior and exterior of the home. Selecting tile flooring that can be carried throughout the house and into the outdoor California room also helps to create the look of one continuous space. Designing an outdoor living room needs to take into consideration how you want to entertain, among other things. Do you envision watching Sunday’s big game in the fresh air? If so, consider how intricate you want your outdoor electronic system to be, including TVs, internet, and sound systems. If you’re a foodie, you may want to take it one step further than the typical built-in barbeque, and consider including a pizza oven or rotisserie in your design. And if star-gazing is your thing, how about incorporating a built-in fireplace as a central gathering place for family and friends? With Sea Pointe Construction, you get a design-build team that coordinates the entire process from start to finish, including design, engineering, and construction all in one contract. Our teams of professionals are industry experts and will use their experience to deliver more than you know to ask for. With so many options in outdoor remodeling, you’ll appreciate seasoned professionals whose experience can help design and construct the perfect space for you and your family to love. Gone are the days of basic barbeques, so allow your imagination to meet possibility, and let’s work together to create the outdoor living space you’ve been dreaming of!